If someone told me I’d be making roti almost every night (and getting them round) – I would have asked them what they’ve been smoking? I didn’t even like roti when I met Mangy, I was a through and through rice girl. Well, all that’s changed! The Jowar rotis turned out BEAUTIFUL. Better than regular rotis, soft, slightly nutty taste…lovely and puffy. They’re VERY filling. Umang who usually eats 6 to 7 regular rotis, had to force himself to eat 4 of these. He reckons he could have stopped comfortably at 3. 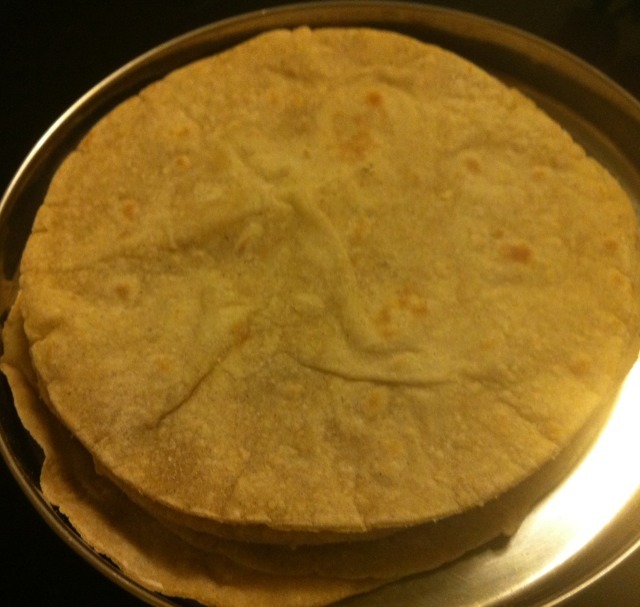 I have never see Jowar rotis being made, I know there’s some finger action going on, but I don’t know how to do it the old fashioned way – so I worked out a method that works for me. Bring the water to a boil in a large pot (more surface area) – add the salt and dissolve well. Add the flour by sprinkling it across the surface of the water (don’t stir now) – put the lid on, and leave it boiling on the stove for about a minute. Turn off the flame and let it sit for a couple of minutes. Essentially you’re sort of steaming the flour. Remove the lid, and stir the flour into the water. No dramas if you get lumps, or if it doesn’t stir in a 100%. Just get it to the best you can and then remove the dough and put it in a large bowl or your work surface (I use a baking silicone mat). Let the dough cool, and then knead well for a few minutes. You’ll see the dough come together and there shouldn’t be any cracks. It’s quite an easy dough to work with. Cover the dough and leave to rest for about 30 minutes – you just want to make sure the dough is completely cool before trying to roll out. When you’re ready to make rotis, pinch of some dough, the size of a golf-ball. Press down onto your work surface, sprinkle flour on top. Using your rolling pin, gently roll outwards. Keep sprinkling flour and pick up the roti and turn it over as you go. It’s more of a pressing action, you’re trying to spread the dough outwards. Unlike regular roti, the dough has no elasticity, so it won’t spring back. Don’t worry about the shape, just keep spreading out as thin as you can. If you tear it or make a hole, just patch up and keep going. When it’s thin enough, use a round plate and cut into a circle (father-in-law’s tip). I don’t do this for regular rotis, but with the jawar roti, it’s incredibly difficult to maintain a consistent shape. Don’t waste the trimmings, they go back into the dough to be rolled out again. To cook – put the rolled out roti on a dry tawa, on low-medium heat. When you see bubbles appear on top, flip the roti over, crank up the heat to high, and the roti will slowly puff up. To aid the puffing up process, press down on the air pockets gently with the back of a spatula. Essentially the Jowar roti can be split easily into 2, or the pockets can be filled with something yummy. Serve hot, with ghee or pickles or your favourite curry. Enjoy!